Experience the beauty of Chicago on a tour full of history and excitement. See all of the city’s highlights, such as Grant Park, the Adler Planetarium and the Orchestra Hall, home of the famous Chicago Symphony Orchestra. Visit the Art Institute of Chicago, featuring a world-renowned collection of impressionist art. See one of the world's largest aquariums, pass by President's Obama's old neighborhood and more. Upgrade your Chicago tour to include a river cruise! Discover the best of Chicago on this tour of the city’s South Shore! Travel by comfortable, air-conditioned coach through the beautiful Jackson Park where the Columbian Exposition of 1893 was held. Pass through the University of Chicago, with its elegant English-style architecture, and drive by the Museum of Science and Industry, a tribute to man's ingenuity and inventiveness. Witness one of the world's highest apartment buildings, Lake Point Towers -- an architecturally stunning building of glass and curves. 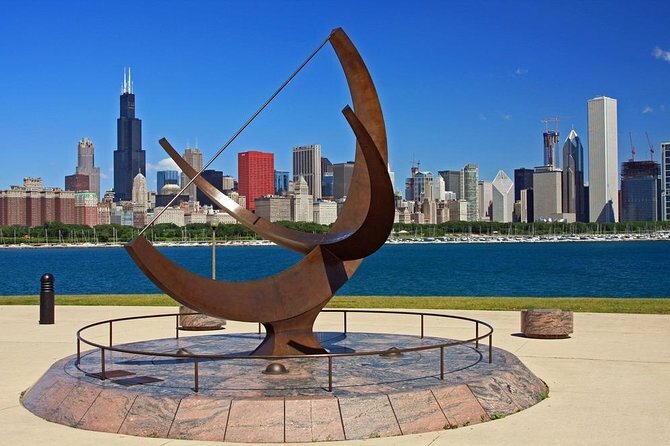 See Navy Pier, Chicago's inland port, and stop for a photo opportunity at the Adler Planetarium to admire its sky dome. Then, pass by President Obama’s former neighborhood and house! Upgrade your Chicago tour to include a cruise on the Chicago River! Soak in picturesque lakefront views, admire the city's bridges and see the famous Chicago Locks. Spot other points of interest along Lake Michigan’s shore, including Navy Pier and the Coast Guard Station, and admire the beautiful city skyline.